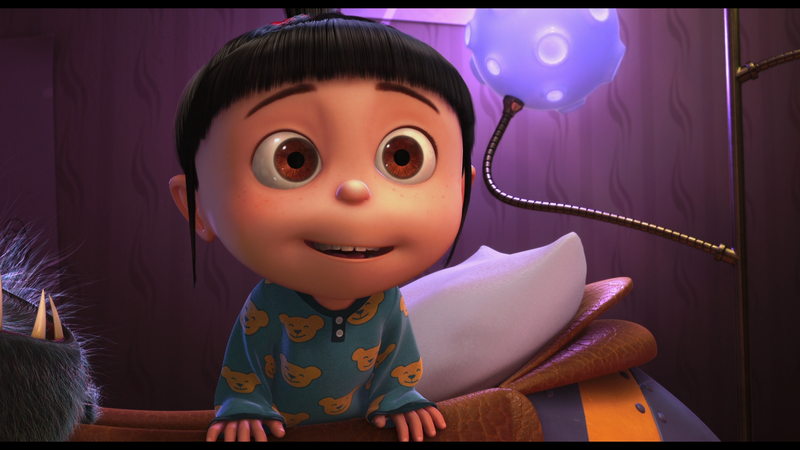 Probably the hallmark of Despicable Me is that it has great sight gags and they will hit you very frequently indeed. Whether through dialogue or by visuals this film will have you laughing one way or another and that kind of persistence is something you have to love. It is a surprisingly good film because you may have thought it revealed all the tricks up its sleeve over the year plus Universal has been promoting it but there is more in store believe me. It is also a film that asks you to take things at face value. It will not bend over backwards to establish this is the universe in which our story exists but instead will show you it. It may be challenging for adults who have to willfully suspend disbelief while children will gladly do so. One thing to keep in mind is that the inciting incident of this film is the discovery that a pyramid has been stolen and been replaced by an inflatable. In a world where such a thing can happen nearly anything can like orphans selling cookies, same-day adoption, shrink rays, etc. A standout feature of the film was the score and particularly the “Despicable Me” theme song sung by Pharrell Williams. Heitor Pereira has long been making valuable contributions to film scores but his work on this film might be his calling card in the future. Despite the fact that the names of the actors were heavily advertised as well, the cast does a fantastic job of becoming invisible and blending in to their characters. Examples being Russell Brand who plays the elderly assistant Dr. Nefario. Miranda Cosgrove who plays Margo the oldest girl and you do even stop thinking about Steve Carell as Gru and just see Gru. This is a film the effectively incorporates flashbacks to illustrate who Gru is on more than one occasion so we can see what his motivation for his lunatic plan is and why he feels he must do it but we also take the journey and start to see his change of heart. It is a film that also finds an extra villain, at least a temporary one, in a somewhat unexpected place. The film really is ingenious on a number of fronts with its gadgets and gizmos, aforementioned sight gags, with the whole plot about the moon but especially with the creation of the minions. You get here the rare thing created in animation that just you can’t quite classify, you know not what language they speak or where they’re from but they’re just there and it’s great. The creativity and the quality of this film again illustrates how the animated feature is flourishing. About the only thing you can hold against the film is that Gru doesn’t explain that he didn’t call the orphanage, you understand he is torn at the moment but considering the character he is dealing with she could’ve been even more forceful in taking them back leaving him feeling worse. Even with that Despicable Me is a joy to watch from start to finish and one of the summer’s most pleasant surprises and was, overall, a more throughly enjoyable experience than Toy Story 3. This film will likely be the most entitled to feel robbed should the Academy’s love affair with Pixar continue.